Before being pardoned by President Richard Nixon in 1971, the infamous labor leader spent four years in prison for the crimes he committed as president of America's largest union, the International Brotherhood of Teamsters. (The list of crimes included jury-tampering, mail fraud and bribery.) Two weeks before Hoffa's disappearance, on July 30, 1975, federal investigators discovered that hundreds of millions of dollars had been stolen from the Teamsters' largest pension fund. Their attention immediately turned to Mafia bosses Anthony (Tony Jack) Giacalone and Anthony (Tony Pro) Provenzano, both of whom reportedly agreed to meet with Hoffa on the very day of his disappearance. While the suspects and motives were clear, evidence proved far more elusive. (Officials later resorted to hypnotizing suspects and witnesses to gather evidence against the Mob; it didn't work.) The FBI began its search anew in 2006 at a horse farm in Michigan; the investigation yielded nothing. Hoffa's body has never been found. 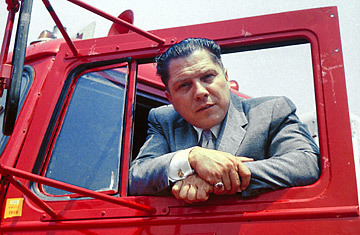 His son, James P. Hoffa, now presides over the Teamsters.